Reynolds sat fourth behind Shane van Gisbergen, Garth Tander and Nick Percat on the restart 16 laps from home, where the top two cars sailed off at a greasy Murray’s Corner. That handed the lead to Percat, but Reynolds soon pounced, squeezing by on the front straight and leading for the duration, despite yet another yellow in the last 10 laps. “I’ve got nothing left to give. I’m absolutely spent,” gasped Reynolds after celebrating on the roof of his Commodore. Victory marked the ultimate redemption for Reynolds less than two years after being dumped by Prodrive, while it was a long-awaited win for veteran co-driver Youlden. “It’s taken me 18 years to get here, it’s grouse,” said Youlden, in his first year with Erebus after being let go by Shell V-Power Racing last year. Pye and Luff were also thereabouts all day after two strong initial stints from Luff, who was the only co-driver to take the start in the treacherous conditions. Coulthard and D’Alberto never appeared to have the pace of the top runners but briefly looked to be in the box seat for the win as the fuel strategies played out in the final two stints. 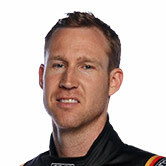 Third gives the Kiwi the championship lead, displacing team-mate Scott McLaughlin whose car finally stopped on lap 75, some 30 laps after co-driver Alex Premat first reported engine troubles. 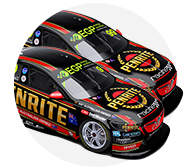 Fellow title contender Jamie Whincup also suffered engine dramas, spending the bulk of the second half of the race in the garage before emerging to score a handful of points in 20th and also passing McLaughlin in the title race as a result. 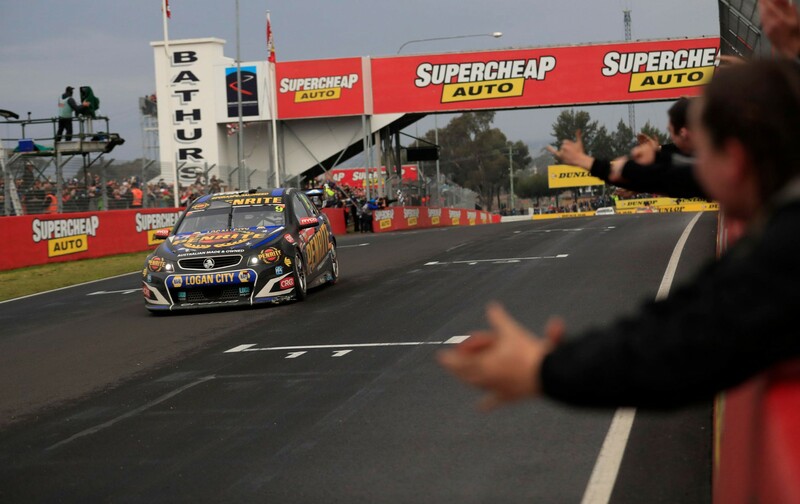 Dale Wood and Chris Pither added to Erebus’ joy in fourth after steering clear of the trouble, while van Gisbergen dragged his Red Bull Holden home fifth, just 10 seconds from the lead. Van Gisbergen had been a lap down mid-race after a rough run for co-driver Matt Campbell that included several off-track excursions. Sliding out of the lead on the critical restart and dropping outside the top 10, van Gisbergen recovered to challenge for third before again going off 11 laps from home, requiring another charge through before the flag. Michael Caruso/Dean Fiore and Todd Kelly/Jack Le Brocq benefitted from the chaos to score a respectable sixth and seventh for Nissan. Jason Bright/Garry Jacobson were the top Prodrive Ford home in eighth after its three fancied entries all struck major drama. Chaz Mostert/Steve Owen recovered from early dramas, including a pitstop infringement penalty, to be second with 20 laps to go, but pitted for fuel under a Safety Car. Mostert spun the hapless Tander at Hell Corner on the subsequent restart as the Holden driver attempted to recover from his off at Murrays, earning the Ford a penalty. The 2014 Bathurst winner eventually dragged his car home 10th, while Tander crashed at The Cutting and was 18th. Cameron Waters/Richie Stanaway were 16th after strategy also buried them in the pack before the chaotic restart, where the Monster Ford took damage trying to avoid Tander. The pair dominated proceedings in the wet, particularly with Stanaway at the wheel. 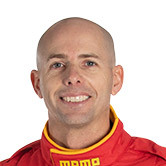 Mark Winterbottom appeared to have survived the day’s chaos to sit fifth on the penultimate lap, only to crash was he was being hunted down by van Gisbergen. GRM also had a bitter end to its day as James Moffat spun out of third at McPhillamy on lap 139, before crashing out for good a short time later. There was heartbreak too for Brad Jones Racing, with Percat locking up and spearing out of third following the restart with six laps to go, eventually failing to finish. Tim Slade and Andre Heimgartner salvaged ninth for the team, with the Kiwi taking over for the final few laps from an overheated and exhausted Slade, who had struggled with a lack of in-car cooling.